Up to 2 metres tall. The fuzziness of the fine needle-like foliage is in evidence. There is plenty of space between both the flowers and the sub-umbels. Note how the in-furled petals resemble the negative stud of PP3 battery terminals. 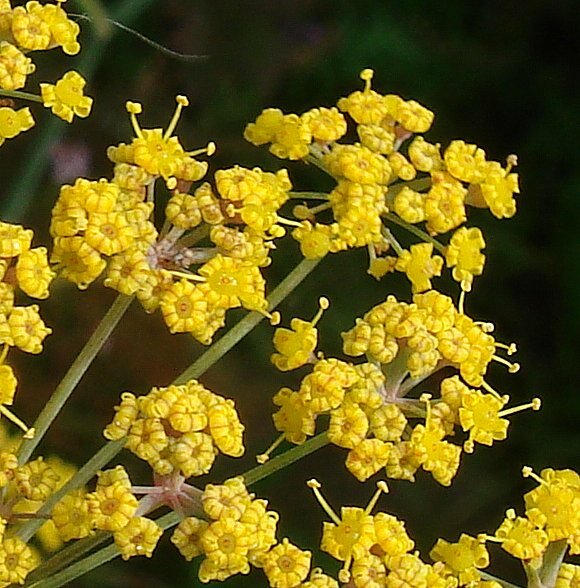 The flowers are yellow, one of only few umbellifers to possess a yellow umbel. The sheaths around bifurcations in the stem are not inflated. The very fine filigree nature of the leaves. Fennel as it appears as a cultivar vegetable, with a swollen stem-base resembling a heart. Wild specimens of Fennel do not have such swollen stem-bases and are poisonous; they should not be eaten. Nearly ripe Fennel seeds, used in cooking to impart an aniseed flavour to dishes such as curries. (Two ripe ones top left). Some similarities to : Giant Fennel , but Giant Fennel is up to 3 metres height, whereas Fennel reaches but 2½ metres. 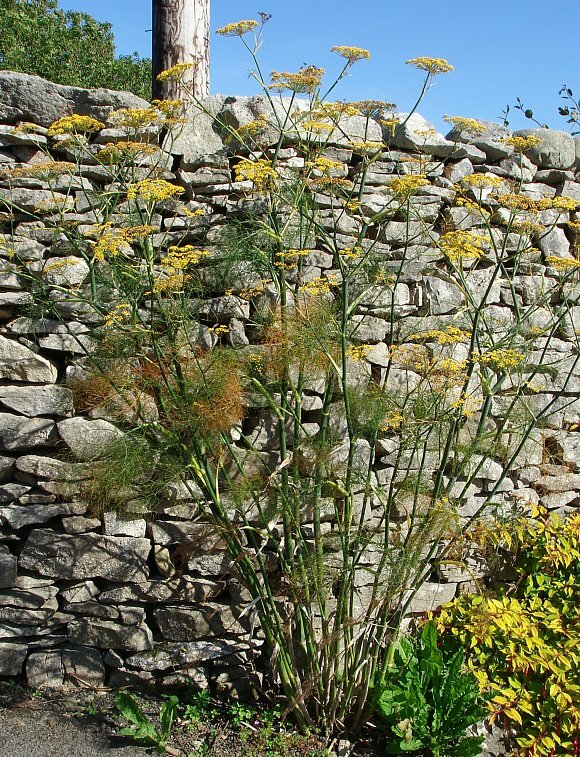 Also to Dill , a perennial herb with yellow flowers similar to those of Fennel and with which it can cross-breed. 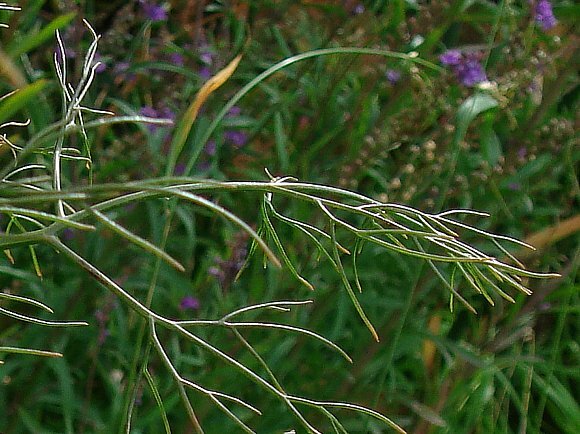 Resemblance to : Hog's Fennel , but Hogs Fennel has darker yellow flowers, and the leaves are not thread-like as in Fennel, but repeatedly cloven into thin strands. 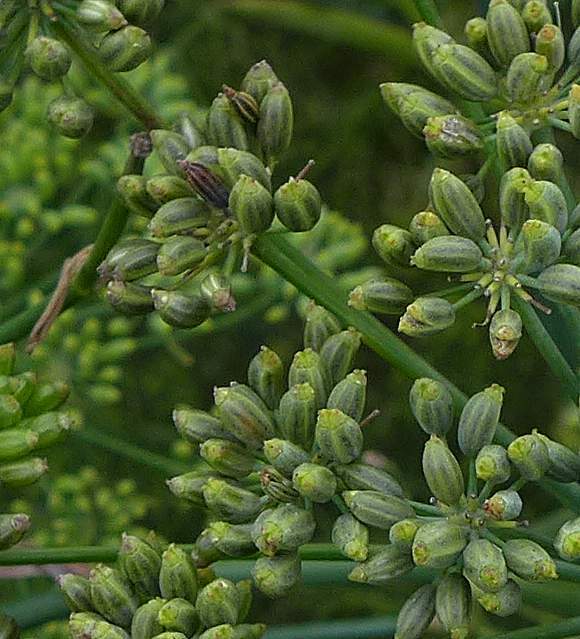 Distinguishing Feature : Fennel smells faintly and tastes slightly of aniseed, but certainly not as strongly as does Sweet Cicely but which has white flowers and not yellow flowers. Note how the individual flowers, with their five in-curled petals, look like the female halves of the metal studs used to 'button' up modern waterproof clothing, or like PP9/PP3 battery terminals. 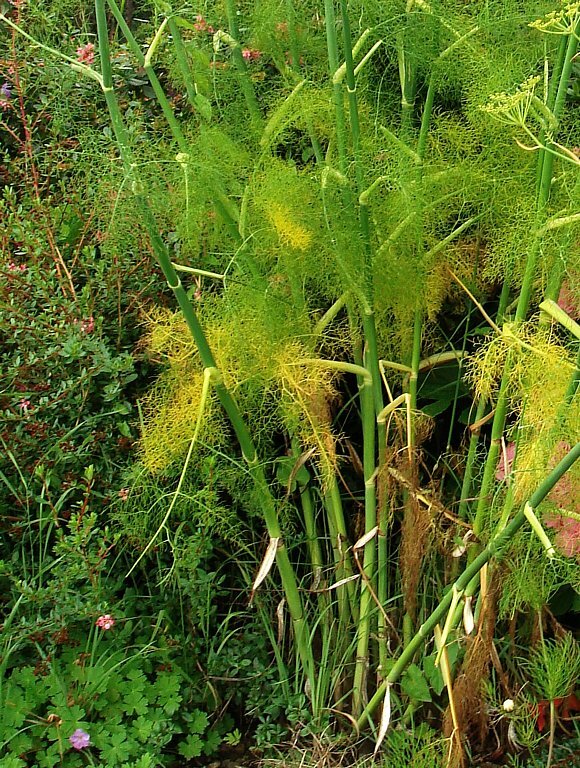 Fennel releases a volatile chemical signalling molecule which inhibits the growth of surrounding plants. Your Author cannot find which volatile is responsible for this effect, but whilst trying, he found that the damaged leaves of plants (in general) release 2-Hexenal and other 6-carbon atom volatile aldehydes which also act as signalling molecules to other plants in the vicinity, triggering several responses in neighbouring plants. It was noted in the 18th Century that after snakes had shed their skins they ate Fennel to help restore their sight, due to the presence of Anethole. Fennel is also used to flavour liqueurs and toothpaste. 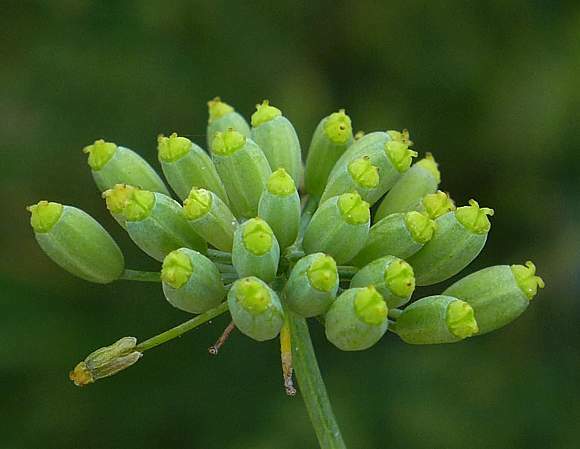 The leaves of Fennel, when it is not yet flowering, can resemble those of Garden Asparagus, or even the Mayweeds . 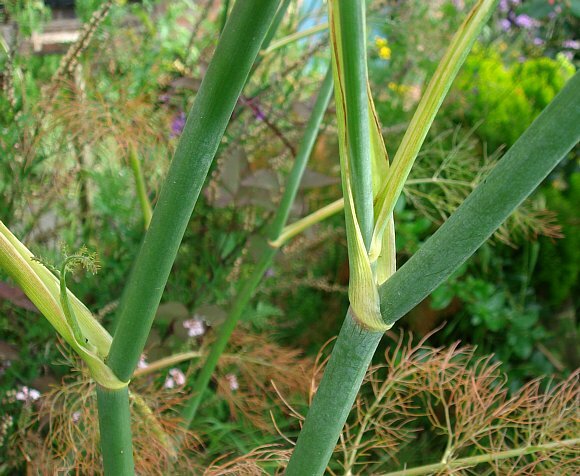 The thick upper stems of fennel quickly taper at the ends, to end in a thread like leaves which branch off. It is an archaeophyte and occurs in open ground, waste places and especially near the seaside where it is well naturalised. It occurs throughout the British Isles but is rarer in the northern half of Britain and all of Ireland. The garden variety of Fennel, a cultivar, can be eaten as a vegetable, usually the lower part before it splits into many stems and just above the roots. The vegetable Fennel has layers reminiscent of onion layers, the whole thing resembling an alien heart with several aortas emerging out of the upper-most part; these being the beginnings of the multiple stems. 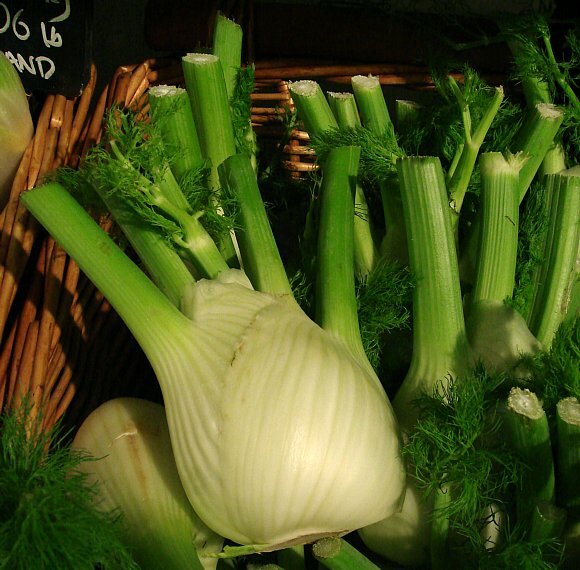 Sweet Fennel (aka Florence Fennel) (Foeniculum vulgare var. dulce) has larger and more aromatic fruits and swollen leaf-bases containing more anethole. 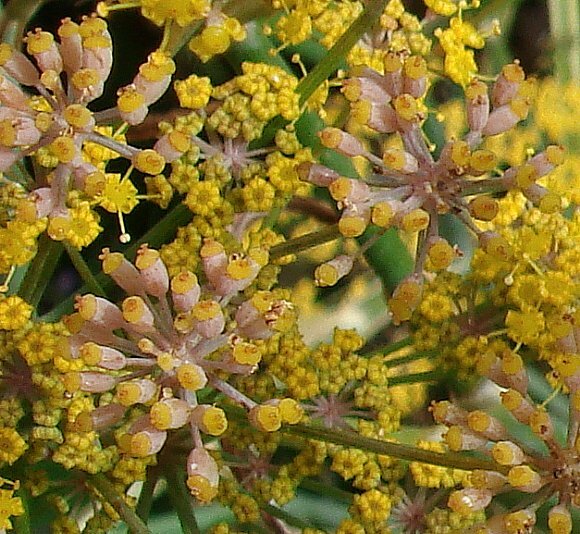 Carosella (Foeniculum vulgare var. piperatum) is another edible form grown mainly in Italy. 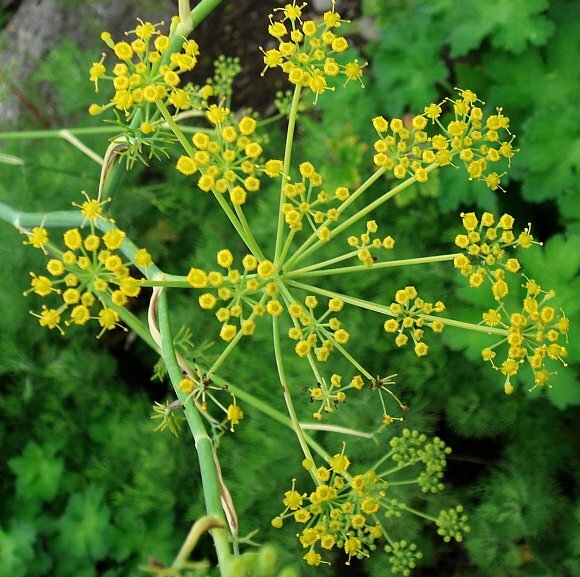 Wild varieties of Fennel are poisonous and should not be eaten! Fennel also contains several phototoxic furocoumarins such as Bergapten, Imperatorin and Psoralen, which can cause a reaction when in contact with skin which is then exposed to sunlight, but they are normally safe enough to eat after the Fennel has been cooked. 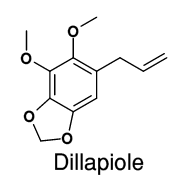 Dillapiole is a phenylpropanoid related to Eugenol and to Apiole, and is present in both Dill and in the roots of Fennel. Chemically it is similar to Myristicin found in Nutmeg which has some hallucinogenic and mind-altering properties. Fennel contains the odorous aniseed-like molecules Anethole and its isomer Estragole, and Anisaldehyde. Anethole has an anise-like smell and taste not dissimilar to liquorice and possesses anti-inflammatory and anti-tumour properties and is a potent anti-metastasis drug to prevent cancer cell migration through the bloodstream. As well as also smelling of anise, Estragole also has a hint of mint and sweetness about it and is used in perfumes and flavourings, but its further use is being re-appraised; it is suspected of being both carcinogenic and genotoxic; it has been shown that Estragole can give animals tumours. Both Fenchone and Fenchyl Alcohol are found in Fennel, from which they probably derived their names. Fenchone is an aldehyde, which has a warmish smell of mint and camphor. Fenchol or Fenchyl Alcohol is a minor constituent. Both are very similar to Camphor. The volatile oil from Fennel seeds contains the mono-terpene α-Pinene which is similar in structure to Verbenol and Myrtenol and contains the same reactive 4-membered ring. It is found in many coniferous trees, including Pine, from whence it derived its name. It has a resinous and pungent pine-like odour and is also found in Rosemary. It exists in two optical-isomeric configurations, the (-) species being more predominant in European Pines; the (+) in North American pines. A racemic mixture of the two forms is present in Eucalyptus oil. The similarly smelling isomer, β-Pinene has the double bond moved from the 4-membered ring to the methyl group and does not occur in Fennel, but does in Yarrow. Octenol , or more specifically 1-octen-3-ol, is also known as 'mushroom alcohol' for it smells of mushrooms, and is indeed present in several mushrooms (including edible mushrooms) as well, surprisingly, in Fennel and in exhaled human breath. Octenol attracts flies and insects, and is used as the attractant (together with CO2 in high-voltage fly traps to kill them. It is also used in some perfumes; little wonder some smell so awful. Sabinene has a similar chemical skeleton to that of Thujone, but lacks oxygen atoms. Sabinene is a bi-cyclic mono-terpene with a strained cyclopropane ring. It occurs not only in the seeds of Fennel but also those of Carrot and Black Pepper where it contributes to black peppers' spiciness. It is present in the trees Holm Oak and Norway Spruce . Petroselinic Acid is also found in Garden Parsley (Petroselinum crispum) from which it obtains its name. It is a Fatty Acid which is positionally isomeric with Oleic Acid where the double bond is on position 6 atom instead of number 9. It is present in Fennel and Coriander seeds and is a characteristic fatty acid constituent of the Umbelliferae (Carrot Family) of plants. It contains no Selenium.